ELK’s Lake’s Five is a story that involves a monkey’s rescue from a mobster’s tower, by the other animal characters of the game. 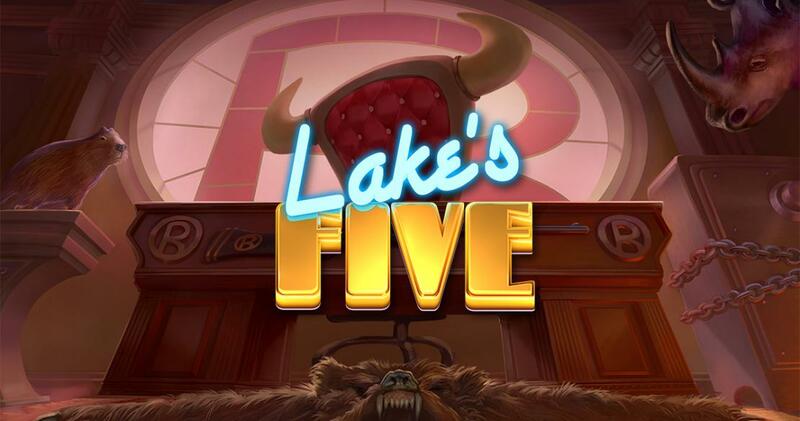 Lake’s Five is one of the newer releases that are coming via ELK Studios, a developer that’s not launching games often, but it makes sure that the quality is high in each title it puts out. The story goes that a monkey has been kidnapped and taken to an impressive tower that is owned by Mr. Romano, presumably some kind of mobster. Five animals are coming to the rescue, and that explains the presence of all the game’s main characters on the reels. The image in the background shows a huge skyscraper that is taller than any building from that city, while the reels have the monkey, along with an elk, a goldfish, a parrot, a crocodile and an elephant. For lesser symbols, they relied on images of diamonds and a doctor’s bag. A high-end design to be sure, and easy to enjoy since every symbol you see has images appropriate for the game. This game is going to give you 5×4 reels, with only 178 ways to win, meaning that the symbols need to connect horizontally or diagonally, it’s not enough for them to be on neighboring reels. Payouts of $3,000 are promised, while as features there will be Wild Respins, scatter symbols and The Heist bonus game with free spins. All ELK Studios games share the same betting system, which starts from $0.20 and can end up at a maximum of $100, all the while having 100 coins in it, no matter what value was selected. The scatter symbols are going to be turned into wilds, but only if there are only two of them visible on the reels. The reels which have the wilds get moved one step down each re-spin, until they leave the game area. The Heist is a bonus game that can be started with help from three scatter symbols. You get 10 free spins at the start, but with each new key that you get in the bonus game, 1 additional free spin is offered. Collect three keys from reels 1, 3 & 5, to unlock walking wilds, sticky wilds, climbing wilds or multiplier wilds of up to 3x. You don’t get huge potential rewards from this game, but there are complex free spins to be had, if you manage to trigger them.